It has been said that many authors seem to be unable to grasp or describe how big outer space is. So it takes a bold and visionary Science Fiction (SF) writer – and I mean “visionary” in the sense of being able to come up with a vision of a setting in outer space – to describe space in both scientifically acceptable and literarily pleasing ways. Some writers gloss over the whole thing – it’s just “big”, “enormous”, or “there”. Others try to think beyond the usual ways of describing it. So, how big is it? 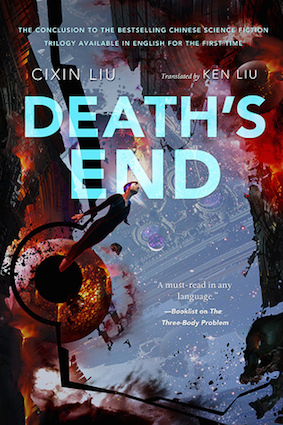 And does LIU Cixin get it right in his sweeping epic of a space opera novel, Death’s End? OK. So, it’s big. Apparently, the scientists who torture themselves by critically reading Science Fiction, also find that many SF writers have no sense of distance in space, and also get the basics wrong of time, mass and size, energy, and velocity. The question is, how factually or scientifically correct does fiction have to be, in order for it to be convincing and readable? What distinguishes non-fiction from fiction is the leaps of imagination of the author. And what makes it enjoyable for the reader is the strength of conceptualization of the ideas that the author puts forth, and how he or she engages the reader with those ideas, through language, characterization, setting and plot. By definition, fiction does not have to be truth, but sticking to the basics of how the world works helps to make it understandable for the reader. It gives them a cement pole to hang on to in the choppy sea waters of the story, so to speak. The character – therefore Liu’s – words almost explains the nature of the novel, the sense that one is reading a report of the impact of inter-planetary contact on the human race, on earth’s science, societies, religions, history, politics and economy. Liu doesn’t deal with just one nation, like many writers do, for instance casting Americans as heroes that save the entire world. A few of his main characters, for instance Yun Tianming and “Cheng Xin”, the so-called “Swordholder”, might be Chinese, but the rest are from all over the world, and in any case, by about the middle of the book, both gender and nationality have become superfluous in humans. In fact, even physical bodies have become irrelevant. Timeline for Universe 647: 18906416 –…. He doesn’t write about one engagement of the human race with another race from elsewhere in the galaxy, but about humans engaging with many other species from many other galaxies. He envisions space as not in three dimensions but in four (and it gets seriously weird at that point.) He takes what we do know about space, and conceptualizes it a couple of quantum mental leaps beyond that. It reminded me of The Tale of Genji (early 11th century Japanese novel, 1216 pp. in paperback) by Murasaki Shikibu, in terms of the length, the level of detail and the historical scale, and also Liu’s ability to nevertheless maintain internal consistency. What does that do for the reader? It is not hard to read, because of Liu Cixin’s explanations and very carefully thought-out scenarios (typical approach: when this happens, then that occurs, because of this, which is followed by that, and in case you thought what about that person, then he or she reacts like so…etc., etc.) He states matters so bluntly and matter-of-factly that it sounds highly convincing, and I think he would make an awfully good Spin Doctor in a second career. Of the many concepts of outer and future space that Liu introduces, three stood out for me: the “[Space] Staircase Program”, the “Fourth Dimension”, and the “re-embodiment of Tianming’s brain”. It sounds like pure imagination, but it is not so inconceivable if you know that a similar idea, the “space elevator”, which is also introduced in the novel, has been around for a long time. The International Space Elevator Consortium (ISEC) has the mission to promote space elevator development. Here is a 2017 paper that ISEC produced on the history of the space elevator concept: Space-Elevators-A-History-31Mar2017. This is exactly the space elevator which Liu describes as the transport mechanism which Cheng Xin uses to reach a meeting with Yun Tianming, hundreds of years after the Stairway Program. It is another example why his work is classified as Hard SF. Liu’s depiction of the fourth dimension really impressed me, considering that it is almost impossible to describe, at least in the words that we have for it at the moment, which barely covers terms understandable by plebs – me for one. A popular philosophical, rather than mathematical, paper on the fourth dimension was published in 1884 (yes, 1884, not 1994), which shows how long this debate has been going on. On the assumption that multiple universes exist, as in this novel, a fourth dimension is possible since in multiverses, the known parameters of physics no longer apply. In physics, three dimensions of space and one of time is the accepted norm (a line describing one dimension, a plane describing two dimensions, and a cube describing three dimensions). However, it is easier to theorize about the fourth dimension and even to illustrate it, than to describe how it feels to be in it. Liu acknowledges the limitations of the human mind to grasp being in a fourth dimension. In this strange situation, the astronauts encounter a dead ship, and the AI in it says to them: “When the sea is drying, the fish have to gather into a puddle. The puddle is also drying, and all the fish are going to disappear.” This is a phrase that Liu also uses in The Three-Body Problem. Only if you work through the previous two novels will you be able to grasp the significance of the words. To get to the meeting with the man who had bought her a star, Cheng Xin travels to a sphere at a Lagrangian point in space, “…the distance between the elevator’s terminal station and the Lagrangian point being about 1.5 million kilometers, or one hundredth of an astronomical unit”. Again, back to the science behind the idea: A “Lagrange point” is a location in space where the combined gravitational forces of two large bodies, such as Earth and the sun or Earth and the moon, equal the centrifugal force felt by a much smaller third body. So, the most philosophical, emotional and human moments of the novel are those between the two protagonists, Cheng Xin and Yun Tianming. For all the science and technology in it, the grand scope and epic scale of the narrative, the pivotal moments are just those between two old friends who were never even lovers. In other words, Liu connects with his readers through romance and – unexpectedly – fairy tales. I don’t want to spoil the ending, but the novel starts with the rather inept Science student, Yun Tianming, and his unrequited love for the brilliant and beautiful Cheng Xin, his fellow student. He loves her so much he is willing to die in outer space for the sake of making her project, the Staircase Program, succeed. Earth needs to “…send a representative of humanity into the heart of the enemy”, and Tianming is willing to become that sacrifice. In the end, only his brain makes it. And not to give the ending away, but later he also gives her a universe. This resonated with me. In the 1980s, so-called star registries sprung up, and I thought it a suitably poetic gesture to have some invisible speck that had long since ceased to exist named, in Latin, after my boyfriend of the time. I got a pretty purple and gold certificate and the long number of the star I had bought a name for, not realizing that the whole thing was hokum. The International Astronomical Union (IAU) actually designates stars, planets, asteroids, comets, and other heavenly bodies according to internationally accepted rules. The IAU does not sell names for heavenly bodies – nor can they, or anyone else, sell a heavenly body. If only I’d read the small print. But, I understand why this idea is so romantic. Wouldn’t we all like to gaze at a twinkly star and know that it is ours, in a way? Whether, and how, the star-crossed lovers, pardon the pun, ever get together, I’ll leave the reader to find out. But that sub-plot is charmingly, if soppily, romantic. Liu introduces three fairy tales into his frame narrative, and, like the one character remarks, they are lovely fairy tales. They are called “The New Royal Painter”, “The Glutton’s Sea”, and “Prince Deep Water”. They are in the style of classical Chinese fairy tales, complete with princes, a princess and kingdoms, monsters and magic and missions, but in the main narrative Liu uses them as mechanisms to introduce ideas for the defence of humanity. These fairy tales and their interpretations by earth scientists are pivotal right until the end of the novel, and the trilogy, and the “death’s end” to which the title refers. It is not merely a once-off incident in the plot. Fortunately, Liu does not make the mistake, like many authors do, of getting lost in the sub-stories and creating quotes within quotes within quotes, and forgetting to stick to the voices of the characters. Here, he avoids this confusion by emphasizing that the characters who are narrating and recalling the stories make a particular effort to remember them word for word, and subsequently the scientists analyze and revisit every word as well. And, while they are complicated, the words of the fairy tale characters stay reasonably simple and do not introduce other sub-stories. This is a magnum opus, the third in a series of magna opera. How Liu managed to hold it together I do not know – it is quite a feat. It is not particularly sweat-inducing or sniffle-generating. I would say the overall tone is cool, despite the narrative of cosmic destruction. And surprisingly, for such a long novel, it does not contain superfluous text or repetitions. It is, as I mentioned, written in formal business-like English with the occasional metaphor or simile, and the emotions of the characters are shown by their actions, not by their dialogue or inner monologues. In that sense, it is fairly typical of many novels by Chinese authors that I’ve read. The journey to the conclusion of this long work is never irritating or boring. But as with any massive work of fiction, a few pages per day provides sufficient mental flossing to engage and puzzle the reader. I cannot say without a doubt that Liu, contrary to what critics of SF have said, gets the scope of space right. He seems to have done so. But he describes the world he has created, complete with its laws of physics, so cogently, so specifically, that I could set all doubt aside and just enjoy it. LIU Cixin (born 1963) is a superstar author in China, and a superstar SF author in the world of literature. Liu is nine-time winner of Kehuan Shijie [“SF World”] Yinhe (Chinese Galaxy) Award: 1999–2006, 2010; winner of the World Chinese Science Fiction Association’s Xingyun (Nebula) Award for best writer: 2010; winner of the 2015 Hugo Award in Best Novel, for English language version of The Three Body Problem; and winner of the 2015 Xingyun Award for Best Achievement. Ken Liu (born 1976) is an extremely prolific American Science Fiction and Fantasy writer, and translator of Science Fiction and Literary Fiction from Chinese into English. He has translated LIU Cixin’s Death’s End (死神永生, 2010) and Three Body (三体, 2008), published by Tor Books as The Three-Body Problem in November 2014. Liu was born in 1976 in Lanzhou, China, and immigrated to the United States when he was a child. Liu earned his A.B. in English from Harvard College and worked in the technology field for several years before earning his J.D. at Harvard Law School and entering the field of tax law. More recently, he has switched to a career as a litigation consultant in technology cases, where he can use both his legal and technology skills.